This is about a bug in Project CalcRx which was causing it to compute the wrong results for Einstein equations or expressions with similar properties. The resolution, and future improvement possibility are also discussed. You can suggest edits to this article at this page. There is nothing peculiar about Einstein equations in this scenario that causes this, it is just how CalcRx was coded was throwing it off. Anything with Base expression (or your parameter variable) involved twice across one or more binary operations would fit the scenario. But in my case, I was writing tests for Einstein Equations and failed it at the beginning. To understand the issue better, consider this scenario. You have an application that is monitoring the velocities of an object moving relative to your probe, you want to apply Lorentz Transformation. The following equation is not true Lorentz Factor because of the missing square root in the denominator, we will see later why. Pretty ugly right? not only above expression looks ugly it will produce undefined results because of the way simultaneous operations are timed. To understand this better, we need to look into CombineLatest. CombineLatest does not care how the data is coming in, as soon as one of the observables in the combination yields an output, CombineLatest recomputes the expression. So if an expression has to wait for all variables involved to be updated before it could be recomputed will fail. The other option is to use Zip, but CombineLatest is thrown in there for a purpose, there are cases where you need not to wait for all sides to post an update to recompute the formula. So what is the option? The answer is to wrap everything cohesive around in one Select. But the way expression tree was being built was, every time an IObservable<T> was combined in a binary operation with a number, it would do Select which turns the expression into IObservable, then all subsequent binary operations will do Select on Select. And if you try to combine two Select-s that would try to join them with CombineLatest. To fix the issue, I implemented the following. Everytime you run into a binary computation between a Select-or and a number, re-write that Select-or to include that select inside. Everytime two observables that are results of Select-s are combined in a binary operation, discard one Select and combine the selectors of both in one Select. The fix helped me generate a very clean and acceptable Expression. I have ended my fix there, but there are still two issues left. The fix is a burden on Parsing because it regenerates the whole Select by prying the existing one open, excavating the selectors out of it and combining it with the other operand into another Select. Notice that the first selector is referencing a0, and second is a1. In the new Select, there would be only one parameter, either a0 or a1. In order to do that, I have done something I am not too happy about. I am walking the whole tree on the other side, regenerating every bit of it because Expression trees are non-mutable and replacing a1 with a0. Now about 2, The Einstein Equation failure. Consider the easier equation that would fail this scenario. How about we divide the number by its square root? That is indeed not expecting too much. For the above I have opened the issue#3 and the fix to that will finish the Einstein Equation fix. So in a nutshell, the issue was the crazy Expressions being generated, I implemented a fix which although one-time but does add an overhead on the parsing and Expression generation part and Einstein Equation or similar would still fail because of the way function calling is implemented. It was an awesome weekend, finally got my hands into SignalR and updated the Ticker.FSharp to add a SignalR web sample ticker. 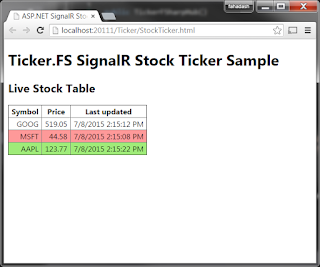 In this post I have talked about how easy it was to throw a simple ticker together using the Ticker.FSharp repository and SignalR. The sample can be downloaded from the Github repository page. As we know, the server-side hub is a primitive component of a SignalR application. My sample hub has only two methods, one is called by the client to start up the hub when it gets launched the first time, and other method is called from the server side that reports the ticks generated by Ticker.FSharp. The call to Tick then channels in to the browsers of each user connected. The full source listing for the hub file can be found at this Github page. I am only discussing the important points. As you can see, the hub declaration contains the HubNameAttribute which tells the SignalR engine how the hub is going to be located. There are two methods inside the hub, one is StartTicker which is responsible for calling the Ticker.FSharp library and obtaining the IObservable<Tick> object. Here I am fetching the ticks of three symbols together. In the above listing, I am calling the Ticker.FSharp 3 times to get the live feed for three symbols. I am also calling the AddIndicator helper method to garnish the object with an additional property that tells me whether the value went up or down since the last value. And finally, I am calling the Tick method which calls the tick method at the client's side. The above Tick() method implementation is pretty self-explanatory. The JS file has quite the code, I am only discussing the tick() handler that server-side will be calling. The above code is simple, as the tick arrives, it checks to see whether the table already has a row for that symbol, if so it updates the data otherwise it adds a new row for that symbol. Thats all for this blog, if you want to check out the full source code, I encourage you to visit the Github project page.